Jean Paul Getty was a man of great ambitions. Already in his 20s he earned his first million dollars by investing in oil fields across the USA. Much has been said about the businessman ever since, but one thing is sure – he was a miser. He hated to spend money, something many other up-and-coming millionaires quickly copied. For one, he installed a payphone in his house to stop visitors from calling abroad and leaving him with the bill. Secondly, he haggled with the Italian mafia after they kidnapped his grandson. Yes, Jean Paul Getty refused to pay the ransom and managed to decrease the amount in the matter of weeks. With money flowing in, he had to spend it somehow, though. This is how his art collection started. Oh, he could limit his friends and family to paying for each phone-call they made from his house, but when it came to art, he did never take “no” for an answer. After acquiring a big amount of art from across the globe, Jean Paul Getty had to exhibit it somewhere and make sure that it is well protected. For this purpose, he built a beautiful array of buildings on a hill in California, a stones throw from downtown Los Angeles. Just the buildings themselves are a piece of art, but it’s the inside that counts. Over a million visitors show up at the Getty Center in California each year in order to have a look at the enormous collection of ancient, classical and modern art that the American businessman gathered up over the years. In fact, the collection is so big that it has been divided in two – one part in the Getty Center, the other in the Getty Villa over in Malibu. You are definitely in for a scenic drive if you want to visit both places in one day. 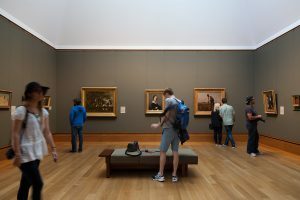 Make sure to check out the different exhibitions that always take place in the two art museums that carry the legacy of Getty. The millionaire had a special kind of interest for Italian/Roman art, hence you are in for a real treat if Pontormo, Titian and Fra Bartolomeo are among your favourites.